Vintermøde i Dansk Egyptisk Selskab: reception, operaunderholdning og foredrag. Mødets leder Lektor Tim Jensen. Velkommen ved Overlæge Birgitte Charabi. II. Operaunderholdning med de smukkeste perler fra Carmen, Aida, Julius Cæsar og sange af Sibelius og Taube fremført med stil og charme i en forrygende blandning af musikalske genrer. Ved operasanger Elinor Wiman og pianisten Maria Bertilsson. III. Medicin og kirurgi i det faraoniske, koptiske og islamiske Egypten. Ved Samih Charabi. IV. The past and present of specialised cancer treatment in Egypt: from the National Cancer Institute to the Childrens Cancer Hospital”. Ved Overlæge dr med. Akmal Safwat. V. Stem cells and the future of medicine. Ved Professor dr med. Mustapha Kassem. Afsluttende bemærkninger ved Arkitekt Jens Kähler. Professor, Department of Endocrinology, University Hospital of Odense and University of Southern Denmark, Odense, Denmark. Human bone marrow stromal cells (hMSC) contain a population of stem cells known as skeletal (mesenchymal) stem cells that are capable for differentiation into several mesodermal-type lineages including osteoblasts, adipocytes and chondrocytes. In addition, they secrete a large number of humoral factors controlling the hematopoietic and osteoclastic cell activities. The aim of our research program is to understand the biological characteristics of hMSC so that it is possible to target them for enhancing bone mass. The following topics will be discussed: a) basic biology of hMSC, b) one major challenge for use of hMSC in clinical application is their limited in vitro proliferative potential and the senescence-associated growth arrest phenotype exhibited by the cells during long-term culture. I will present results from studies in our lab showing that transducing hMSC with human telomerase reverse transcriptase (hTERT) extended the life span of the cells and maintained their “stemmenss” characteristics, c) I will present recent data regarding the molecular control of hMSC differentiation into osteoblastic cells and the identification of new factors that maintain hMSC in undifferentiated state or promote their differentiation into osteoblastic phenotype. I will also present our experience with applying state-of-the-art proteomic approaches to studying the biology of hMSC. d) Finally, I will present the status of some current clinical trials employing MSC for a number of clinical indications. 2. Kassem M, Abdallah BM, Saeed H (2008). Osteoblastic cells: Differentiation and trans-differentiation. Arch Biochem Biophys. 473:183-7. 3. Lepperdinger G, Brunauer R, Jamnig A, Laschober G, Kassem M (2008) Controversial issue: Is it safe to employ mesenchymal stem cells in cell-based therapies? Exp Gerontol. 43:1018-23. 5. Bellantuono I, Aldahmash A, Kassem M (2009). Aging of marrow stromal (skeletal) stem cells and their contribution to age-related bone loss. Biochim Biophys Acta. 1792:364-70. Cancer is an ancient disease. Bones showing signs of maliganant tumours were discovered among old pharaonic mummies belonging to the 5th dynasty. Cancer is also a modern major health problem particularly in developing countries such as Egypt. The era of modern medicin started in Egypt with the establishment of the first medical school in the middle-east in 1827. This short presentation will give a very brief history of Egypt’s first medical school and first school of midewifery and how these two institutions formed the nucleus of the first state organised health care system. It will then briefly describe the current health care system with its pros and cons followed by a description of the nature and magnitude of the Cancer problem in Egypt. I will then recount the history the National Cancer Institute, the oldest and largest cancer center in the Arab world and the role it played in the care of cancer patients in Egypt. Finally, I will present a brief description of the Children’s Cancer Hospital, a unique example of a major project solely undertaken by private initiative of a non-governmental organisation. 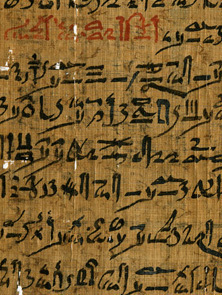 Vor viden om medicin og kirurgi i det faraoniske Egypten stammer fra de mediciniske papyri. De vigtigste papyri er Edwin Smith, G Ebers, Ramesseum, Kahun og Carlsberg. De mediciniske papyri omfatter flere mediciske og kirurgiske specialer. Diagnostik og behandling er beskrevet. Omtalen af den koptiske medicin findes bl.a. i papyrus Carlsberg. Grundlæggerne af den islamiske medicin Al Razi, Ibn Sinai og Ibn El Nafis vil blive omtalt.